The RTX is the best cap in the Multicap lineup. It is also the only Multicap we carry! Many consider this to be the best cap made. This unique cap employs internal bypassing via ten equal yet separate windings connected in parallel. Further, the RTX boasts a superior Polystyrene film and Tin foil construction. The result is excellent detail with a smooth and sweet presentation. Tolerance is 10%. Our precision matching applies to "pairs". You may request a larger matched group, but it may not be possible. 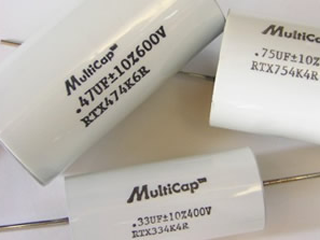 NOTE: capacitors and precision matching are priced and sold individually ("each"). Occasionally, we can not find a matched pair. If this is the case, Customer Service will contact you. We offer three levels of matched pairs: L1-factory tolerance 1% matching; L2-1/2 factory tolerance 1% matching; L3-1/4 factory tolerance 1/2% matching.